I introduced this famous Thai food in Street vendor food in my kitchen before. If you have been to Thailand I’m very sure you have seen the food vendors beside the street, with the owner grilling pork skewers on the hot charcoal stove with the smoke and smell drifting 100 meters away. This is one of my preferred street foods, and this is how I cook it in my kitchen. To make it easier to understand I present the ingredients in 4 parts. • 1 tsp corn flour mixed with 2 tbsp of cold water. • 2 tbsp vegetable oil. 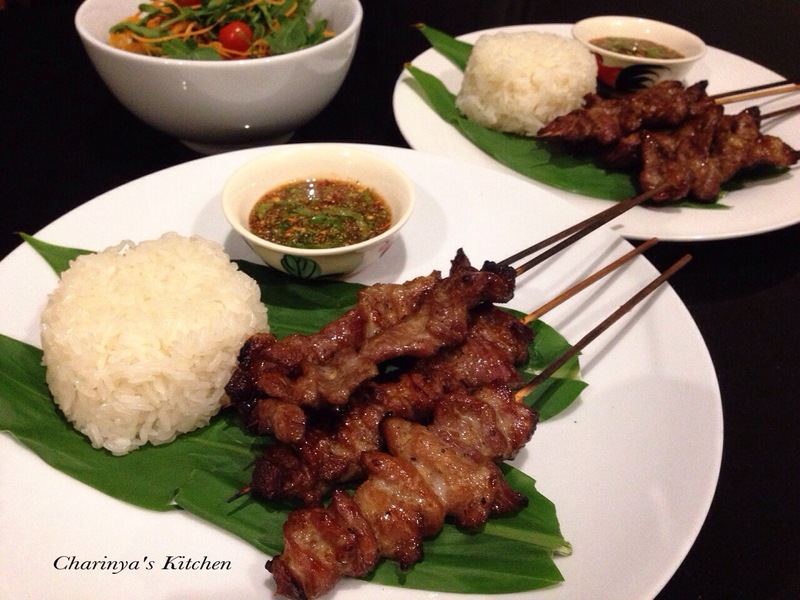 Equipment: Bamboo skewers, soaked in water for 3-4 hours before use. 1. Make the marinade paste (Part 2) by pounding the coriander root, garlic and white peppercorn using mortar and pestle. This is marinade base is used regularly for Thai cooking. We call it “Samh Gur สามเกลอ”, which means “3 mates” as these three ingredients always go well together. 2. Put the marinade paste from step 1 into a large bowl, Add all the ingredients from Part 3 seasoning sauce and mix well. You can taste if the flavour satisfies you and you can adjust as desired. Add meat and mix well then add the ingredients in Part 4. 3. Cover and marinate in the refrigerator overnight or for at least for 3 hours. Thread the pork onto the skewers like making a “kebab”. The pork skewers are ready to grill or BBQ over medium heat until slightly charred on the outside and cooked through on the inside. Brush the coconut milk on the pork occasionally while it’s on the grill. For the dipping sauce I use fish sauce, sugar and tamarind puree (ratio 2:1:2). Mix well then add ground red chilli or flakes to your preferred heat, followed by about 1/2 tbsp. of ground roasted glutenese rice. Top with a bit of chopped coriander and/or spring onion.